Hello and Welcome from Michigan. The "13" represents the New York DSO District Sales Office. The district number tells the district where the car is either destined to go or from where it was ordered. The remainder is the specific dealership that ordered that car. You should check with Marti to see if he still have the original invoice for the car. It is a great piece of original paperwork to have. Hello Timecruiser, welcome to the best Forum you could have picked for you and your 72 Mach 1. As rackerm posted, 13 is the sales district the ordering dealer is located. The C090 would identify the ordering dealer. It's possible Marti may provide you with the Dealer name associated the C090 code or research it for a fee. Since you were able to obtain a standard report, he still has the original Ford invoice. Or....you could reach back into your pocket and order the more detailed deluxe report since your goal is to restore your car to factory specs. As the years went by, Dealers changed hands, closed, or had their sales districts changed by Ford. So while the sellng dealer may still be in buiness today, the chances of having the same sales code are slim. Good luck with your project and remember, we believe there is no such thing as stupid questains, so never hesitate to ask if you have anything you want to run by us! As others have said, your best bet would be to order the original factory invoice from Marti for $55. 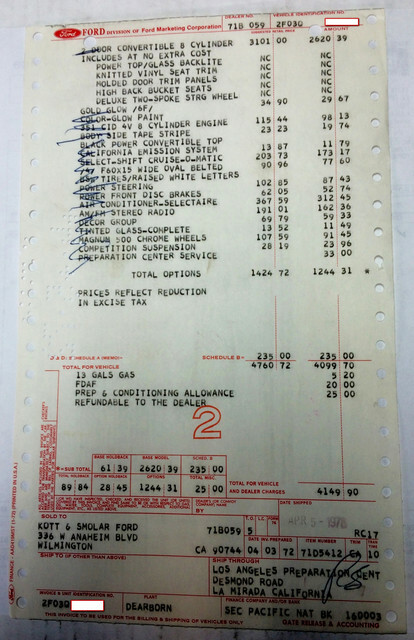 These are the original invoices that Ford used back in the day, not a copy or reproduction. If restoring to original, this would be very nice to have. Here is an example of mine. Welcome from a fellow UK member...Where in the UK are you? and collected the returned paperwork after delivery. Notice the sample has "2" stamped on it. terse response. May be the Holy Grail of Mustang documentation along with the build sheet. Pure original and only one exists. You will need to prove you own the car to get it. That rare. You can see in the sample it was printed on an old line style printer, the letters don't line up. Also notice the buyer paid $5.20 for 13 gallons of gas, "I" only paid $4.00 for 12 gallons. As I have different order dealer code to that of the dealer that actually sold the vehicle would that mean my car was probably moved from one dealer to another? ?